All Nifty Notes (Mondays here on the blog) contain an original image — all photographs taken by me — and a thought-provoking, fun and/or quirky message. Some of the best advice she ever got was from her Dad. 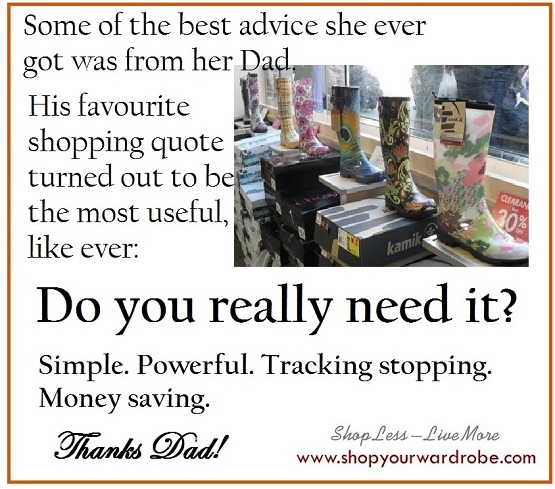 His favourite shopping quote turned out to be the most useful, like ever: Do you really need it? To inspire you to think about your shopping in a new and fresh light. Feel free to share these original Nifty Notes. I only ask that you share them in their entirety/without any cropping or editing.